For years the lower ravine was utilized as a disposal site and the location for the Allegheny College campus’ large privy. The introduction of indoor plumbing to the campus in the 1880s and 1890s necessitated the removal of the pungent structure. Once the offensive odors dissipated, students would cross the ravine by climbing up and down its steep banks. A section of the ravine known as Panther Run was crossed by a narrow shaved-log bridge. In 1910, Sarah Cochran provided the funds for a rustic bridge to be built to ease travel across the lower ravine. The original structure lasted only five years and was not replaced until the 1930s. The bridge was again replaced in 1938, 1970 and most recently in 1993. The rustic bridge is a landmark cherished by Allegheny students. Legend has it that if a freshman woman is kissed on the thirteenth plank by an upperclassman, the men of the freshmen class will remain dateless for the remainder of the year. Subsequently, each year a band of freshmen men steal the thirteenth plank. The construction of the bridge marked the beginning of Allegheny College’s effort to transform the lower ravine from a wild and unkempt gully into a place of beauty. 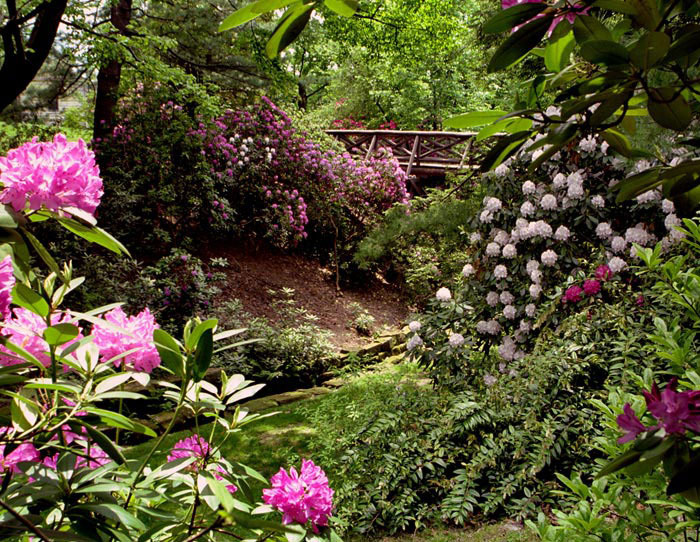 In 1910, trustee chairperson Frank A. Arter donated two hundred rhododendrons from Port Jervis, New Jersey along with a with a considerable amount of planting soil. The rhododendrons were planted in the ravine. A few of the original plants still bloom each summer; however, most have been replaced by hybrid plants of the same species. The blooming of these vibrant plants is anticipated each year by alumni. The blooms are so extraordinary that in 1948 biology professor, Chester Darling, attempted to delay the blooming of the rhododendrons until the commencement ceremonies in June by placing dry ice around the plant’s roots. Efforts to beautify the campus continued in the fall of 1914 in anticipation of the centennial celebration of Allegheny College. Cochran and Arter jointly contributed roughly 1,000 trees and shrubs to the campus with an addition 400 evergreens donated the following spring. Allegheny President William H. Crawford and Professor Darling made a special effort to plant and acquire new species of trees and shrubs for display. By the early 1950s, over 300 varieties of plants were added to the campus aesthetic. Darling had hoped that the campus would be designated an arboredum but interest in the initiative was lost after the Second World War. A survey of the college grounds in 2000 identified at least 120 different species of trees on the campus. Rhododendrons in bloom in the lower ravine. ~ Source: The Wayne and Sally Merrick Historic Archival Center, Allegheny College. Rachel Raczynski, “Rustic Bridge and Lower Ravine,” NW PA Heritage, accessed April 26, 2019, http://nwpaheritage.org/items/show/48.